Update after show: You can watch the entire episode here. This program was brilliantly done, funny yet respectful of the troops, nice use of President Obama and, of course, the actual hair shaving of Colbert. It will be re-run tonight at 7:30 CST on Comedy Central. Colbert or Colbert and his staff can be amazingly clever, doing bits that seem so obvious, but not done by anyone else such as his business suit in a desert camouflage material, his attempts at basic training, the shout outs to the very enthusiastic audience of service men and women. Excellent job last night. A nice change from Jon Stewart, who while putting together a funny show last night, still tends to rely much too much on the F word for laughs. This week Stephen Colbert's Colbert Report will feature 4 shows he taped in Iraq in front of the troops. The first program airs tonight at 10:30 CST. He appeared in his first taping wearing a camouflage suit and tie. Did the general Odierno really shave his hair to look more like a soldier? Should be worth staying up for. 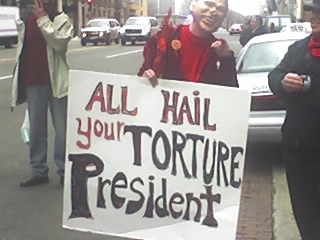 Our son in law's office is right in the middle of the Iraq war protests going on in Washington D.C. today, the 5th anniversary of the beginning of the war. He snapped a couple of photos with his phone and sent them to me. Who knows what "Meatout" is supposed to mean. It's hard to get any work done around there when so many people are tying up the streets, shouting, blocking doors. Not to mention trying to get home tonight. Illinois congressman, John Shimkus is taking heat for his comments in the House yesterday before that body voted to override the president's veto on an Iraq pullout. He used a sports metaphor to make his point, more specifically, a Cubs/Cardinals metaphor. His argued that the game between the Cardinals, his beloved team, was tied going into the 15th inning. The Cardinals then decide to leave the field, quit the game, giving the victory to the Cubs. So it would be if we left Iraq before the war was won. "Who wins? We know it’s the team that stays on the field. Arbitrary deadlines and a date certain accept defeat before the conclusion of the contest. It is our national security interest that continue to take the field and support a moderate Arab state. Leaving prior assures a loss for us and victory for our opponents which will lead to another extremist Islamic state." This statement has brought out protests from left leaning blogs, newspapers, and veterans, with those groups saying he has trivialized the life and death situation in Iraq. Sports as metaphor for life is as old as man. They are found in Greek, Roman, Biblical writings. Take the Bible, for instance, certainly not a book which could by any stretch of the imagination be considered trivial. Paul to Timothy again: "I have fought the good fight; I have completed the race; I have kept the faith." 2 Timothy 4:7. Hebrews 12:1: Now then, with all these witnesses around us like a cloud, let us also rid ourselves of every burden and the sin into which we easily fall and with patient endurance run the race that is laid out before us, looking to Jesus who gives us our faith from start to finish." 1 Corinthians 9:24-27: "Do you not know that those who run in a race all run, but only one wins the prize? Like them, run to win! Everyone who enters an athletic contest goes into strict training. Now, they do it to win a wreathe that withers, but we do it to win one that never withers. So I run with a clear goal ahead of me. I fight and do not just shadow box. Rather, I beat my body and make it my slave so that, when I have called others to line up for the race, I myself may not be disqualified." Sports as metaphor for faith and eternal life. John's critics have no understanding of how sports metaphors have been a part of war, politics, religion, love, hate, etc forever. Speak so that your listeners may understand. John did that and did we understand? If anything can be learned from Rep. Shimkus' remarks it is that we are not currently winning the in Iraq at the present time, but are at an impasse, a tie. Something new we learn. As an added bit of trivia, Fight the Good Fight, a hymn written by John Monsell in 1863 was sung in the 1981 movie, Chariots of Fire. "I never learned to fight for my freedom. I was only good at enjoying it." The Anchoress has a thoughtful post on war, Iraq, Christianity and war, and freedom. Give it a read and see if she doesn't make some excellent points. Or, give it a read and say where she is wrong. Her post is not one to "react" to, but to think about. I believe much of what she has to say is well worth sharing. The execution of former Iraqi dictator, Saddam Hussein, is finished. However, the world news outlets have been keeping watch all night and probably will all day today, for something, anything, to break out in that country. Long after there was anything more to report, the news folks kept reporting and repeating, waiting for riots and bombings to light up Iraq in reaction to Hussein's death. They've so far settled for shots of joy coming from the automatic weapons of Iraqi's victimized by that man. The most inane question heard on one of the morning news shows was this: "Does this (Saddam's hanging) send a signal to other dictators?" I don't want to trivialize the just passing of one of the modern world's most ruthless men, but come on. Does anyone seriously believe other dictators are now shaking in their boots picturing themselves as the next to hang? Although very glad Jill Carroll was released from her captives in Iraq on Thursday, I was beginning to get a bit creeped out at all the news footage of her talking to TV and still wearing the Muslim headscarf. Thankfully, she has now been photographed leaving a plane in Germany wearing military fatiques. Some reports say she made a propaganda video for her captives as a condition of her release. "Carroll did what many hostage experts and past captives would have urged her to do: Give the men who held the power of life and death over her what they wanted." I doubt anyone is blaming her for anything, merely trying to understand what happened. "I was ten years old, but they changed my age to 18 for execution"
This post by Michael Totten should not be overlooked. Take a few minutes to read what he learned during travels through Iraqi Kurdistan. Things he learned about how Sadaam Hussein's minions tortured and killed their Kurdish citizens and the memorials to them that are open to the public today. Engrossing photos accompany this story. "When you enter the museum you will walk through a long and winding hallway. The walls are covered with mirror shards. Each represents one of the hundreds of thousands of Iraqi Kurds murdered in the genocidal Anfal campaign. A river of twinkling lights lines the ceiling. Each represents one of the five thousand villages destroyed by Saddam Hussein." The WB11 news in St. Louis had a story on gas prices and gave a link to another site, St. Louis gas prices, which lists the lowest gas prices in the area. This site is not as up to date as the previously cited, Gasbuddy, but it's worth looking at. They also post the highest gas prices and the Illinois side of the river dominates. Jeff Goldstein of Protein Wisdom has taken up the "math formula" gauntlet which is proving to be so popular with writers and ad agencies and psychologists these days. What gives here? I really believed once I got out of high school my exposure to algebra and geometry was over, kind of like getting a flu shot. Age should protect us from somethings. Guess not. Jeff is using algebra, he says geometry, to explain the left liberal position on the Iraq elections. Which means...well just read it for yourself. John Podhoretz writing in today's New York Post takes on all those who just can't be happy for the Iraqis and their election. Or did you momentarily feel an onrush of disappointment because you knew, you just knew, that this was going to redound to the credit of George W. Bush? This means you, Michael Moore. I'm talking to you, Teddy Kennedy. And I would add the writers of this weeks Newsweek, still appearing on cable news shows and finding it difficult, if not impossible to swallow their disappointment that the election did not turn out to be a monstrous horror. Podhoretz: Okay, what politician wants to join Kerry in pooh-poohing an election in which at least 8 million Iraqis braved death to cast a ballot? What politician wants to cite Mubarak and Abdullah in support of that position? Hillary? Hillary, are you there? Wow, suddenly it's so quiet in here you can hear crickets chirping.